​Semester exchange in San Diego. Thanks to our strategic collaboration with other business schools abroad, USD's School of Business offers you the opportunity to study at the University of San Diego through the Business Student Exchange Program. With a nomination from your home university, you may choose to spend one year, one semester or less taking graduate-level courses taught entirely in English. Talk with your exchange advisor at your home university for more information. Once a small seaport town serving a large naval installation, San Diego today is at the epicenter of burgeoning industries such as biotechnology, software development and telecommunications. 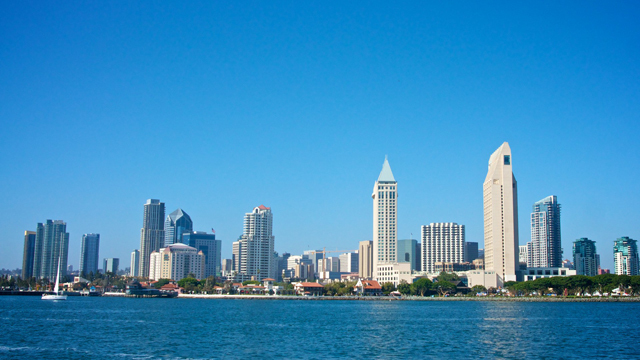 San Diego is one of the top 10 largest cities in the United States and its proximity to an international border make it a region full of diversity. From its legendary beaches to the historic streets of Old Town and the Gaslamp District to its mountains and deserts, San Diego's geography parallels the diversity of its population. The mild climate, unique cultural heritage and unsurpassed recreational resources make San Diego an ideal place to live, work and learn.